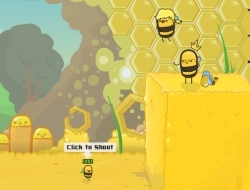 In this shooting game you will play the role of the king bee. He hasnt been a really good one and that is why all the other bees are now rioting and they want to steal all the honey that you are keeping for yourself. The goal is to keep them away from the lot and the way you will be doing this is by shooting each bee before it gets the chance to get away with stealing the precious honey. Upgrade your gun damage, reloading speed and acquire power-ups that will make you a stronger king able to protect the honey. Also buy new weapons and ammo for them as they will be a great improvement. Angry Bees 0.00 between 0 and 10 based on 0 votes.